Time and communication reign king in the transportation services industry. To operate efficiently and effectively, real-time communication, route optimization, asset tracking, and data transfer between drivers and dispatchers are vital. And the right technology should enable these functions to not only maximize fleet operational efficiencies, safety, and customer service, but also save time and reduce costs. With functional form factors ranging from rugged mobile tablets to handhelds, fixed-mount, and ultra-rugged tablets, Winmate’s devices are designed to increase the efficiencies of the fast-paced trucking and transportation industry.The full line of rugged devices where specifically designed to meet the demands of the industry and withstand the rigors of multimodal transportation. 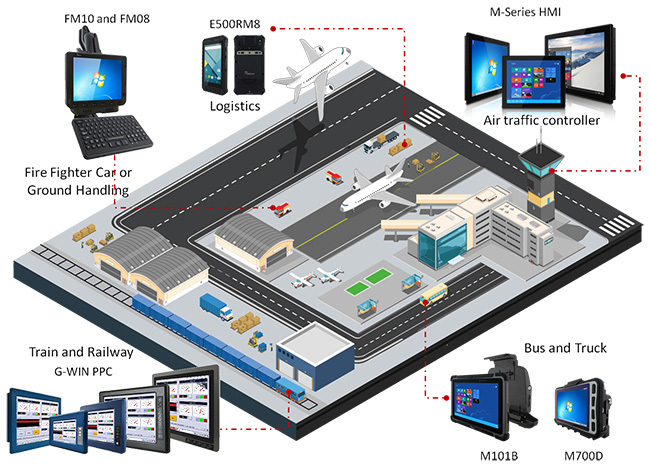 Air Traffic Control : This Winmate M-Series Multi-touch HMI is available with various sizes. Depending on the application, users can select from 10.4", 12.1", 15", 17", 19", or 21.5" HMI. True flat display with an Aluminum enclosure, it is completely sealed system with Front IP65 protection against water and dust, along with a range of I/O ports for expansion options, and an ultra-slim design enable flexibility, and enhanced communication and computing in nearly any setting. Fire fighter car and ground handling service : The FM10 – 10.4" Vehicle-Mount Computer operates on a 1.91GHz Intel Atom E3845 and the full Windows OS. The device features a GFG resistive touch screen with 1024 x 768 pixel resolution. The FM10 is designed for applications that primarily rely on touch input on a large display, with the added benefit of readily accessible programmable function keys. The FM10 delivers flexibility and mobility in a vehicle-mount form factor, designed to easily be removed from the dock with a one-click top latch. Since the dock remains attached to the vehicle, this device can easily be moved or switched from one vehicle to another vehicle. Bus and Truck : The M101B is an enterprise-ready, quad-core powered, rugged, mobile tablet built to withstand the most challenging environments while automatingand streamlining operational efficiencies. With a built-in 1D/2D barcode scanner, HF or UHF RFID reader, the M101B allows for easy trackingof incoming and outgoing shipments, route optimization, and driver communication. The UHF-RFID enables longer read ranges and increased reading speeds to track large quantities from a greater distance. The M700D offers the same asset tracking capabilities as the M101B, with the added benefit of integrated NFC (near field communication) capabilities. The M700D excels in data collection and features robust processing power, continuous power with hot swappable batteries, and multiple wireless communications capabilities to improve productivity and efficiencies. Both the M101B and M700D come with vehicle docking functionality for quick mounting and dismounting. Train, Railway and Emergency Response : This G-WIN, combines a beautiful, rich display with ultra-rugged design and rapid processing. The mountable, slim panel PCs offer a sunlight-readable, transflective, resistive touch LCD display in 10.4, 12.1 and 15-inch options. Intel's Haswell Core processor ensures rapid computing, and with an aluminum die-cast case, the G-WIN is a durable solution.